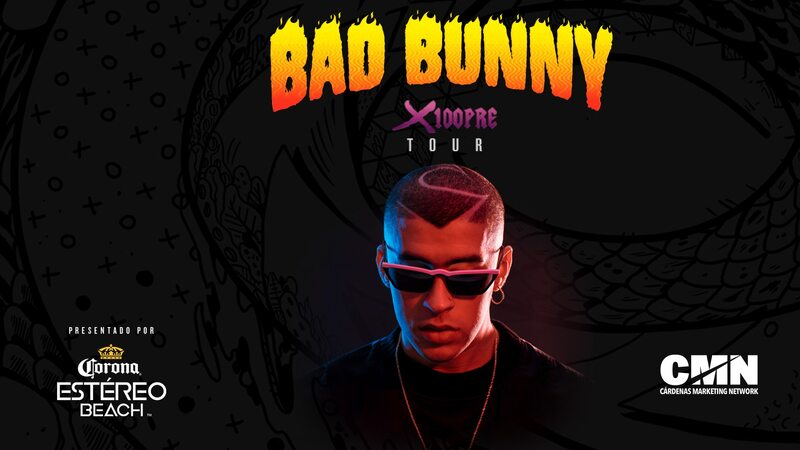 On the heels of his highly-successful tour, GRAMMY-nominated rapper-songwriter and Latin music’s “King of Trap,” Bad Bunny, is announcing the extension of his North American X100PRE Tour Presented by Corona Estéreo Beach. Bad Bunny has had a remarkable start to 2019, from releasing his chart-topping debut LP “X100PRE” in late December to kicking off his highly-praised X100PRE tour in March with sold out shows in Miami, Portland, Seattle, Chicago, Austin and Dallas. The high-energy tour, which still has upcoming shows in markets like Orlando, Los Angeles and New York City among others, has received praise from critics, with reviews highlighting the 360-degree mappable LED stage that gives his audience views of him from any point in the arena, videos that give a deeper glimpse into his journey of becoming Bad Bunny, and surprise performances from some of Latin music’s hottest artists like J Balvin, Becky G, Farruko and Zion of Zion y Lennox. As part of the tour partnership with the brand, Corona Estéreo Beach will bring a sensory experience - building a vibe around the mindset of relaxing with friends and creating an energetic environment alongside the reggaeton sounds of Bad Bunny that will get everyone moving. “I’m thrilled to have Corona join me on my X100PRE Tour to give my fans a taste of Corona Estéreo Beach and showcase their support of Latin music,” It’s not solely about the music – it’s about the culture, creativity, and contributing to the movement that connects us all together” says Bad Bunny. The vibrant concert atmosphere will offer exclusive access to custom Corona branded experiences for fans across the country, while immersing music lovers in the carefree Corona lifestyle. Pre-sale tickets will be available starting April 11 and tickets for the general public will go on sale on April 12 (Varies by market). To buy tickets and see the full tour schedule visit www.cmnevents.com. © 2019 eaglebankarena. All rights reserved.